You don't look that good, Ramien. Well good job, now we have to buy more ketchup. Kings recognising diplomats? Pish posh! I love how they're both just standing there staring at him, instead of... I dunno... trying their hand at First Aid? Pretty sure even a bit of chewed gum gluing his wounds together could be an improvement. If you look at his shoulder, there's a good amount of bloody bandaging where it would appear his arm used to be. Ramien got real messed up, but it seems they've stopped the bleeding as much as you could hope with an injury like this and as much medical equipment as escaping prisoners tend to have. 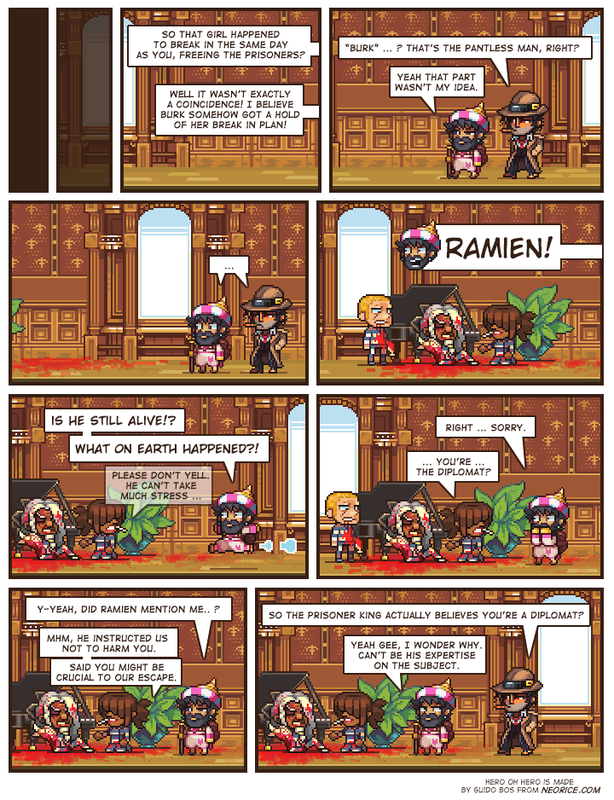 Ramien looks worse than bad ramen noodels. @Tom: Considering how crazy prepared Livarian diplomats seems to be, it'd be quite surprising if they didn't have some sort of First Aid kit on themselves. Then again, Ramien seems to be in such dire conditions than he needs specialised medical treatment. He has lost lots of blood and is missing an arm, which goes well past what First Aid can solve; at best, they could try to stabilise him, but I think he would need to get patched up by a surgeon ASAP if they want him to live. It's interesting that two prisoners stayed with Ramien. I imagine most must have ditched him when things went south. Alternative route to using medical supplies to save Ramien: Magic!